Have you heard about the one with the tortoise in the hare? Sure, but what about the tortoise and the chihuahua? 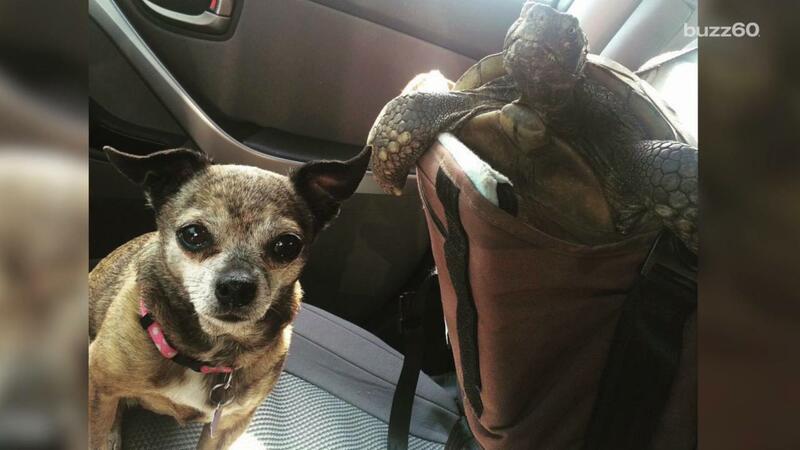 A tortoise and chihuahua are two rescue animals who have become total BFFs. Stanley is a tortoise and, despite the name, Shirley Chicken is a chug, a mix between a pug and a chihuahua. This is the look I get when I tell them we're going to the park, and then I make a pitstop at Starbucks. Who wants to go to the park?!? They have a lot in common: They are both seniors and both rescues too. Actually, that's about it. They're also very sweet and love each other very much. They won't do anything separately! Shirley Chicken even slows down for Stanley during walks. Slow and steady wins the race! Oh, wait, wrong tortoise. Could Twitter be the future of watching live sports?